Having a nice white and bright smile is a clear sign of good health and personal hygiene. The brighter your smile, the more lasting of an impression you can make with those you come into contact with. Over the years as we grow older the enamel in our teeth begins to fade which results in staining and yellowing of the teeth. Many people resort to teeth whitening procedures to brighten their smiles back to their original shade. 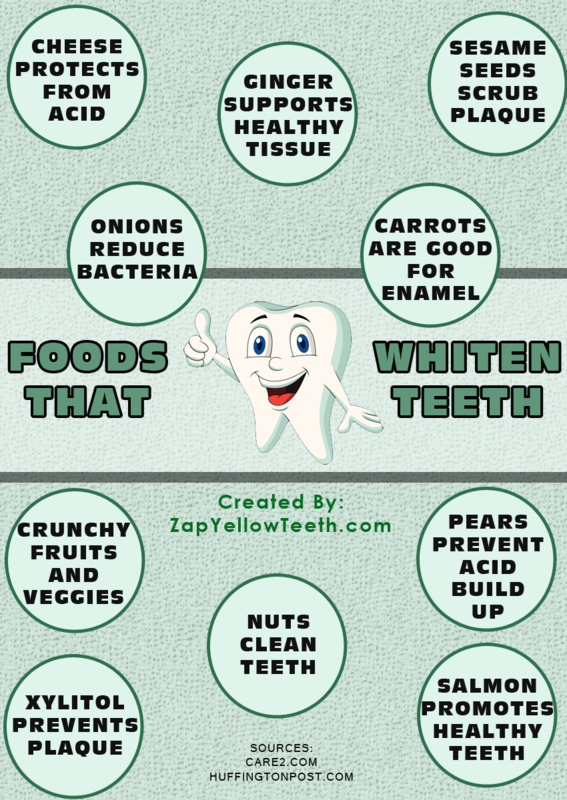 However, there are some things that you can include into your diet that can help brighten your smile. Though none of these foods will work the same as having an in-office whitening session at Tribeca Smiles, they can still help whiten your teeth without causing you to break open the wallet. You can read about these 5 foods below. Strawberries are red in color but can do wonders for the whiteness of your teeth. The malic acid in strawberries acts as a natural astringent that works to remove surface tooth discoloration. Strawberries are available at a farmers market near you. Apples are an amazing snack for strengthening and whitening your teeth. The crispness of an apple works to strengthen gums, while the high water content in apples increases saliva production that helps with wiping away bacteria in the mouth that leads to bad breath and plaque. Celery and carrots are great vegetables to eat when watching your weight, but they’re also great for whitening your teeth! Celery and carrots both stimulate saliva production which helps with washing away food particles and strengthening your gums. Broccoli is an amazing vegetable to add to your diet for your overall health and wellness, however it also does wonders for your teeth. Raw broccoli florets will scrub the surface of teeth which gives them a brief and natural brush. Don’t we wish all of our foods could do this? Oranges are known for their sweet and citrus taste, as they contain high amounts of the acid citrus. The acid in oranges can wear away tooth enamel overtime if ingested in large doses. However, it is a natural teeth whitener. Be mindful of how much of this delicious fruit you consume. Oranges overall are a great source for vitamin C, and for whitening your teeth. This entry was posted in Tribeca Smiles Dental Blog and tagged 5 Foods That Naturally Whiten Your Teeth, dentist nyc, dentist soho, dentist tribeca, family dentist nyc, family dentist soho, family dentist tribeca, food for whiten teeth, foods that whiten teeth, teeth whiteners, teeth whitening nyc, teeth whitening soho, teeth whitening tribeca on September 11, 2014 by tribecasmiles.